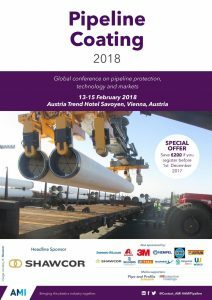 From 13 to 15 February 2018 Arsonsisi will attend the International Pipeline Coating conference in Vienna, AMI’s (Applied Market Information Ltd) annual appointment, this year on its 10th consecutive edition. The two-day programme will analyse the latest technical developments and market trends in the pipeline protection sector and its supply chain. The conference topics will cover application innovations, solutions to industry specific issues, case studies, testing, and quality assurance procedures. Thanks to their high anticorrosive and quality performance, Arsonsisi’s BASEPOX® epoxy powder coatings are used in severe conditions worldwide. Arsonsisi staff will be pleased to supply you with more information and to meet you at Pipeline Coating 2018, at the Austria Trend Hotel Savoyen from 13 to 15 February 2018.